Why Apply for External Funding? The VEF Fellowship Program is one of the key components of VEF’s mandate to enhance bilateral relations between the United States and Vietnam through international educational exchange programs that help improve Vietnamese Science and Technology (S&T) capacities. VEF provides fellowships to the most talented Vietnamese for graduate study (master’s, doctorate degree program) in the United States in Science and Technology. Fellows are selected through a highly competitive, open and transparent process. The Fulbright Fellowship Program is a U.S. government sponsored program designed to increase mutual understanding and the exchange of ideas between the United States and other countries. 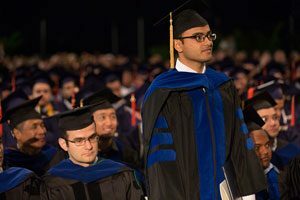 International students interested in studying at FIU apply for a fellowship through a participating Fulbright agency (IIE, LASPAU, AMIDEAST, etc.) and then apply to FIU as a part of the Fulbright placement process. Fulbright Foreign Fellows that attend FIU have their out-of-state tuition fees waived. For more information visit the Fulbright Foreign Student Program web site or contact Assistant Director, Graduate Admissions, Nanett Rojas. There are financial incentives to applying for a fellowship, as fellowship stipends are typically higher than departmental stipends and often cover fees that are not covered by assistantships. Receiving external funding allows students to get paid to work on their own research instead of having to perform duties associated with a teaching or research assistantship or having to pay their own way through graduate school. The prestige that comes with being awarded external funding conveys to potential employers that you are someone who takes initiative, can synthesize and explain difficult concepts, and is an excellent writer, all of which are highly sought characteristics in any job market. You will often be expected to have obtained external funding when going up for tenure. Earning external funding as a graduate student indicates to tenure committees that you will be successful at getting funding at their institution. The FIU committee that awards the Doctoral Evidence Acquisition (DEA) Fellowship and Dissertation Year Fellowship (DYF) takes into account whether or not you have applied for external funding. It is looked upon favorably if you have previously applied for external funding, successfully or not. Applying for external funding is a great experience; it is a chance to improve your writing skills, and any work that you put towards a proposal will make writing your thesis or dissertation that much easier. 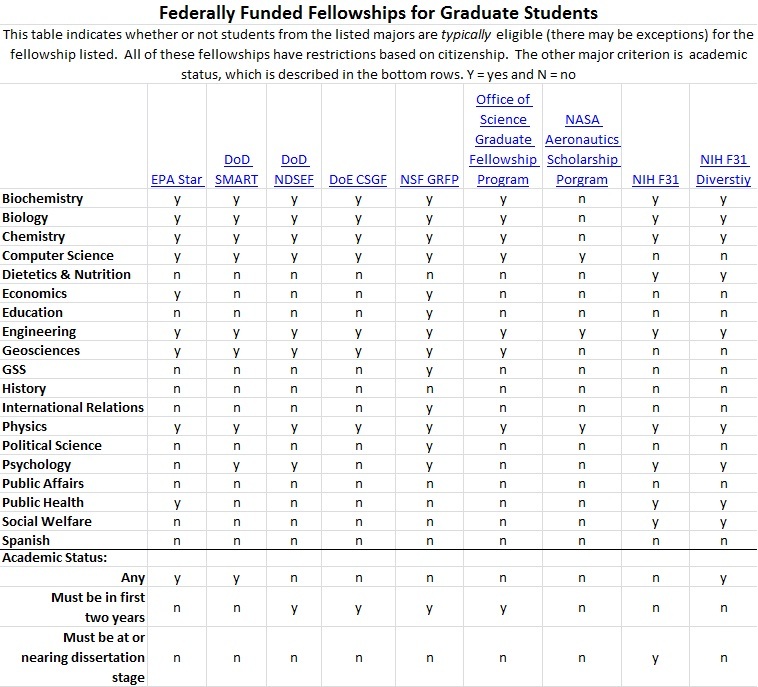 The table below is a list of graduate student fellowships. Click here to see a list of commonly applied to fellowships and their major eligibility requirements. US Citizenship of Permanent Resident Status Required? Chateaubriand Chateaubriand Fellowship Allows doctoral students enrolled in American universities to conduct research in France for 4-9 months. The Make Our Planet Great Again Initiative is offering additional fellowships for research projects related to Earth System Science, Climate Change and Sustainability, and Energy Transition. Hispanic Scholarship Fund HSF General Scholarships All academic areas. Applicant must be of Hispanic Heritage and enrolling in first graduate degree as a full-time student in a U.S. accredited university. Yes, or valid passport stamped I-551 or be granted Deferred Action for Childhood Arrivals (DACA). Robert Wood Johnson Foundation Leadership Development Programs Any discipline Programs are designed to help students advance leadership skills and connect students with other innovators to advance big ideas and solutions. External funding is funding that is provided by an organization (e.g., State, Federal, private) outside the university. There are a number of types of funding opportunities available to students, including everything from small grants for travel or research, to large, multi-year fellowships that cover stipend, tuition and fees, book expenses, and health insurance. How do I search for external funding opportunities? Talk with your faculty advisor about external funding, and review the External Funding Opportunities list on the Office of Research & Economic Development. What if the award offered by a full fellowship is less than the award I would otherwise receive from my departmental teaching assistantship? All of the benefits listed here will only be provided if the student goes through the pre-award process with a ORED Pre-Award staff member. They cannot be negotiated after the application has been submitted to the granting agency. Students on full fellowships (i.e., one that pays a stipend of at least $16,000 or the semester equivalent) will have their non-resident fee set to zero. UGS will provide a tuition waiver for the remaining portion of tuition that is not paid by the award. If the stipend offered by a full fellowship is less than your department’s teaching assistantship, UGS will consider supplementing the stipend up to the TA level. 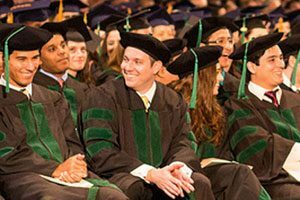 If a fellowship does not provide health insurance, UGS will pay the full cost of health insurance for students on a full fellowship. The insurance provided will be the same insurance that is provided to Graduate Assistants. If I find an opportunity I am interested in applying for, how do I do it? The first thing to do is discuss it with your Faculty Advisor. If your Faculty Advisor approves of you applying for external funding, contact the pre-award office of the Office of Research & Economic Development. Pre-award will help get you started on any internal paperwork that may be required. 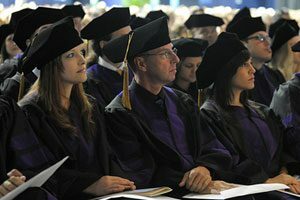 At which stage of my graduate studies should I consider applying? There are awards available for students at all stages of their graduate studies. When you actually apply may depend on your field, and perhaps more-so, what award you are applying for. Awards may have eligibility restrictions based on what stage of your studies you are in (e.g., 1st year student, pre-dissertation phase, dissertation phase). When should I start planning to apply for external funding? As soon as possible. Many applications are due almost 1 year before the award is administered. The most prestigious and competitive awards will require extensive dedication to writing and revising your proposal. Additionally, there may be an award you are not eligible for presently, but you may decide that you want to plan your research so it is consistent with the goals of a particular program, making you a good candidate when you do become eligible. Can I apply for graduate fellowships as an undergraduate? Yes. Many fellowships that fund graduate students allow undergraduates to apply during the fall of semester of their final year. If you win the award, you must be accepted into an eligible graduate program to accept it. Winning fellowships as an undergraduate makes students highly marketable to graduate programs.